Greg Hettinger leaves the mean streets of Philly behind and trades them in for the sunny shores of Southern California. This stint of rehab has him working on his interpersonal skills and coming to terms with his addiction, but trouble seems to have found him on the west coast. A fellow patient thinks her boyfriend drug dealer has put a hit out on her and the hitman could be near so Greg gets entangled in a dangerous mystery. Duane Swierczynski proves that his dark crime noir style travels well as the Cali setting may be bright and relaxed there's still plenty of tension underneath. This one-shot also features the art of the legendary Howard Chaykin so there's a new aesthetic as well and it serves the story well. Greg doesn't look or feel comfortable in the therapy group and Chaykin's style evokes that discomfort in his expressions and body language. Somehow, it's hard to pinpoint, but this issue was tailor-made for Chaykin. 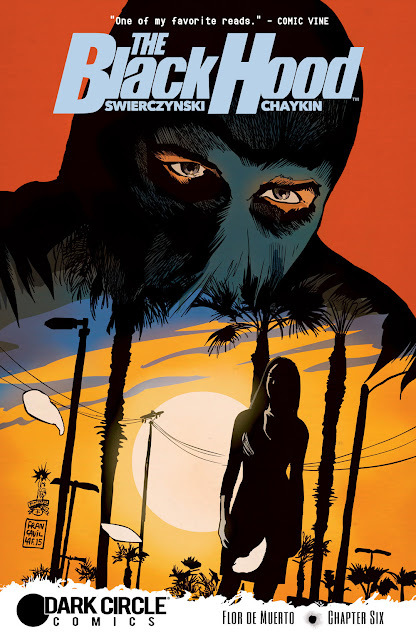 If you've been following 'The Black Hood' (and you should), you'll notice the tone of this one-shot is much more laid-back and less turbulent until the end. However, it's just as contemplative as Greg's regular exposition but this time it comes in the form of him writing back to Jessie back in Philly.There's some twists that turn his respite anything but regenerative and healing. Greg can't seem to shake the burden of the black hood even thousands miles away from home. 'The Black Hood' takes a nice sunny detour to give Greg a chance to heal with Chaykin joining Swierczynski on this breezy but compelling one-shot. A new setting doesn't stop trouble from reaching Greg and the story unfolds like a Hitchcock thriller. Dark Circle Comics is hitting all cylinders right now thanks to books like this.